It’s true, it’s true! 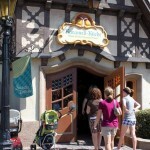 Disney World annual passholders can get free caramel corn at Karamell Kuche in Epcot’s Germany through December 11th. 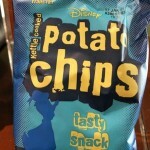 The bag is small — about half the size of a regular small bag, but it’s enough to have a nice snack as you walk through World Showcase. Just heed a few warnings though: you must bring your government issued photo ID and your Annual Pass to get the corn; sometimes they’re out of corn and they give you caramel-covered marshmallows instead (not a fair trade…); and only one bag per passholder per day is allowed. I picked my sample up yesterday (as well a jumbo rice krispy treat covered with chocolate and a caramel drizzle…). Matt and I tried it together last night and thought it was pretty good. I don’t know if it is something we would go out of our way to buy, but it was definitely worth a try. Looking at the display case in the shop, there are several other things I’d rather buy before the caramel corn! 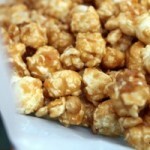 The caramel corn is amazing, but you do have to eat it quickly. Don’t save it for the evening because the caramel will make the corn soggy and insipid. Jay – I noticed that. I also don’t know how long the sample corn was sitting under the counter for the CM to give to passholders. I went there two nights ago to claim my popcorn and they ran out, so instead we were given chocolate & caramel covered marshmallows on a stick. Tasted good too! Thanks so much for posting this. I was just there the other night and had no idea.. so I’ll be back. LOL. Anything free in DisneyWorld is good in my book. 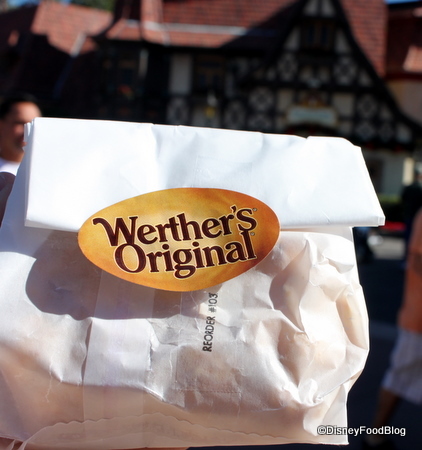 I still have yet to try some authentic Werther’s Caramel corn though. Never knew about the free travel mug & have been on the “tea tour” and purchased lots of different teas at the shop**How do you find out about these “freebies”? Is the carmel corn free in 2017?